I am rather shocked that I have never reviewed a single Hidden Bench wine before. If you were to ask me to name my top three wineries in Niagara at any given time, I can guarantee you that it would find itself on the list with consistent regularity. I like the care they put in, their attention to detail, the small nuances and of course I love their wine. I have yet to have a wine from them that I failed to enjoy. Why you may say “CWG you love all wine” and would not be far wrong, but I have often had bad/mediocre/overpriced wine and I simply try to never do it again. With Hidden Bench this has not been an issue. Located in the Beamsville Bench, the winery spends a great deal of time and effort to make ‘artisanal’ wines. Like the large movement towards ‘craft’ beers in the premium beer market, artisanal, or craftsman made wine is an ever increasing niche. As with craft beers, the effort and quality come with an elevated price. The winery is somewhat pricey when it comes to Niagara wines and is rather exclusive, as many of their wines are simply not available to non wine club members. All this is a better reason to make a regular trip to the vineyards and visit the tasting area, or better yet join the wine club. With the scary parts over with (price and scarcity) we can concentrate on a few other interesting tidbits about Hidden Bench. The winery has three principle vineyards and Pinot Noir is one of, if not the most, the important grapes grown. The Felseck vineyard is where this wine comes from and has turned into Hidden Bench’s Pinot Noir superstar (at least in my opinion). 2008 was a difficult year for the region and it created an environment where producers had to work very hard to get good quality fruit with very low yields. Hidden Bench was no different, in fact from their product notes you can see how little fruit they got from the vines: “A meager 10-12 bunches per vine were left to hang in order to encourage ripening“. All that work helped them produce this stunner of a wine, let’s get into the tasting. I choose to go without decanting, instead allow some time in Pinot glasses before jumping into the tasting. The colour was a nice dark red and the initial nose of plum and cherries was evident. The first few sips hinted at a firm amount of tannins and a long finish. As we got into the wine more, the fruit stayed consistent while a distinct earthiness reared its head. The tannins, while firm, do not overwhelm and the complexity is extremely evident. The finish improved over the course of the glass (and eventually two…) and my mouth was insistent on more. This is an extremely polished wine; it had the right balance of acidity, fruit, tannins and nose to make it a star in the 2008 Niagara Pinot Noir grouping. With the price ($48) and the rarity (few bottles left at the vineyard itself) you will reward yourself by making a trip, buying a few and letting some age for 3-5 years in the cellar. Overall an excellent wine. 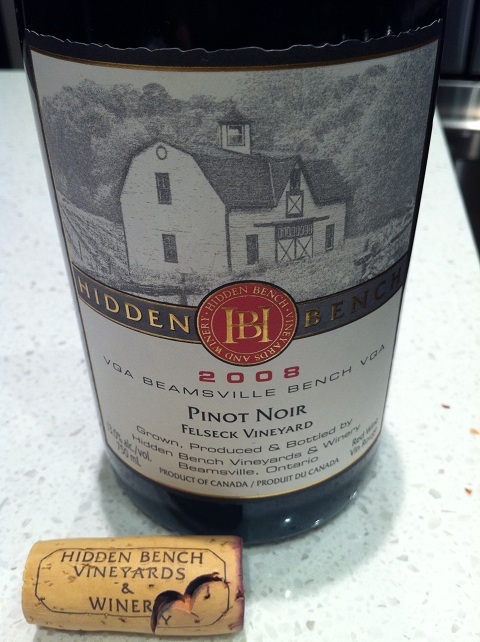 This entry was posted in Canadian, Wine and tagged canadian wine guy, hidden bench, wine review. Bookmark the permalink.